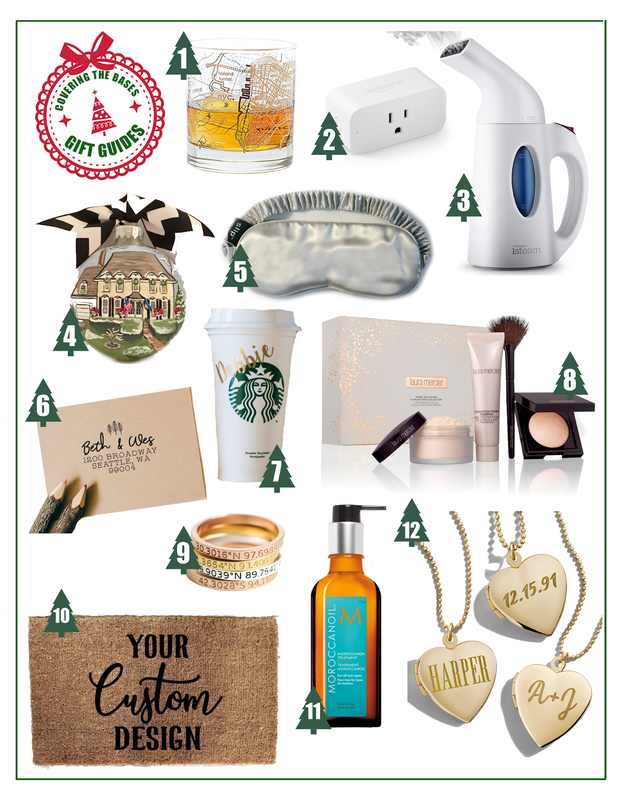 We're back with another fun gift guide! Today is all about items under $50. These gifts are perfect for anyone, but when I compiled them, I had my friends and relatives in mind. I usually spend around $100 on those close to me for Christmas but always seem to have the hardest time shopping when I have budget restraints (like a secret Santa)! When looking for a gift that is budget friendly, my biggest tip would be to go with something personalized. Getting something that speaks to who they are and is custom always makes the gift seem more special! One // Custom Map Rocks Class -- I think this is a really cute idea. I got a pair of Lexington, KY glasses last year and loved them. It was a fun way to have a place so special to me with me in New York. This seller makes just about any map and on a variety of glasses. Great for truly anyone! Two // Smart Plug -- I love my smart plug. I have two in the apartment that are connected to Alexa and you'd be surprised at how much you end up using them! I have mine set up on a timer so the moment it starts to get dark outside my lights turn on and they shut off at 11 pm (which is a good reminder for bedtime)! I also love to be able to tell someone to shut the lights on and off and not have to do it myself lol. Three // Travel Steamer -- This is something I bought back in 2016 and continue to use every single day. It's so cheap and easy to use. This is great for anyone who travels, irons or has a small place. It might seem lame until you use it and realize you didn't know how you ever lived without it. Four // Custom Ornament -- Ok, I love this idea. I love ornaments (I mean, who doesn't) and I love the idea of painting a custom one for a family member or friend. Maybe it's their childhood home, the place you met, or their current apartment/house. Or maybe you go a different way and paint something else on it like a picture of the both of you or a pet who recently passed. This is meant to serve as a really sweet memory for the person you're giving it to. Five // Slip Silk Eye Mask -- I sleep with this every night. It's kind of bougie but it's really nice and under $50 so it made the list. It comes in a ton of colors, is really cute, and it's great for sleeping/helping with wrinkles! Six // Custom Address Stamp -- I've been looking into this so I added it to the list. Writing your return address a million times can get annoying. How much fun would it be to just stamp it on? I like that you can customize the look. This would be great for newlyweds or new homeowners. Seven // Custom Starbucks Tumbler -- This is on my list for my bachelorette party. How stinking cute are these tumblers! Everyone loves the look of the Starbucks cup, why not get their name on it? I think it's a great gift (that can be stuffed with a gift card for the avid coffee drinker!) for all the girls on your list. Eight // Laura Mercier Prime Set Glow Gift Set -- There are a TON of makeup options that are under $50 but I wanted to put a gift set on here that is 100% worth it. I love these products and use them all the time and think this is a set where you'd actually get use of everything. Nine // Coordinate Rings -- I thought this was another really sweet and thoughtful gift. Everyone loves a good, dainty ring. Adding coordinates of a special place would be a perfect gift. Ten // Custom Doormat -- I got this for my friend during secret Santa last year and it said "Cover charge: queso and wine," which are two of her favorite things. She had just moved into a new apartment and I thought it would make the ideal gift for her, and it did! It's still there to this day. Eleven // Moroccanoil -- This is one of my holy grail products and something I think every girl should use all the time. I've never known anyone to not like it but it is a bit more of a selective gift in terms of who can get it. Just wanted to add it since I love it so much! Twelve // Custom Heart Locket -- I saw this a couple weeks ago and thought it was really cute. I love its old school look, and you can customize it in so many ways. It also looks much more expensive (imo) than $50! If you missed it, you can check out my other guides for this year HERE!